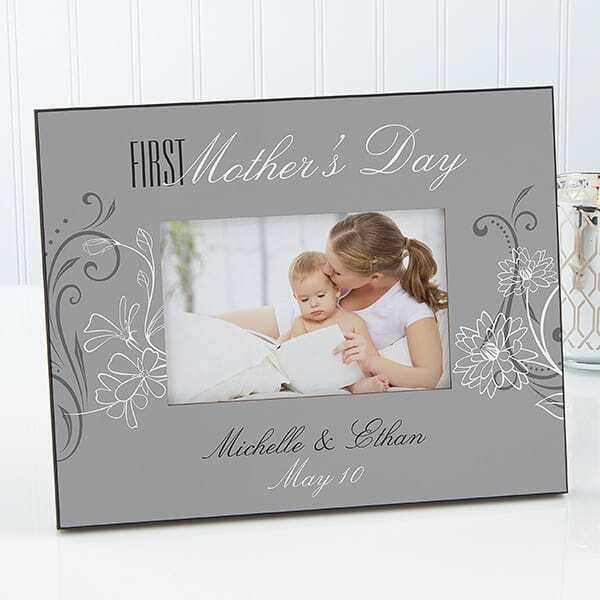 First Mother's Day frames are the perfect way to commemorate the new mom’s first Mother’s Day. Well, her first Mother’s Day as a recipient rather than the giver of gifts! Whether she’ll admit it or not, every new mom eagerly anticipates Mother’s Day. It’s nice to be pampered and to have a day devoted to celebrating and honoring you. It’s time to put one of those many new baby pictures to use. Choose a frame from our selection, grab a favorite picture of the mom and baby, and get ready to celebrate! Beautiful keepsake frame features a sentimental poem to Mommy from the baby on one side. Add a favorite picture on the other side to create a sweet gift that the new mom will adore! 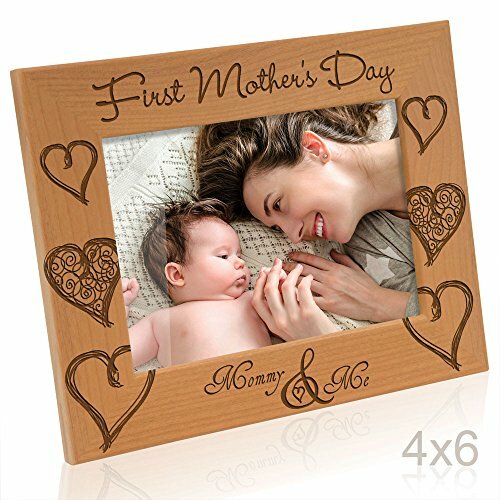 This unique frame is an ideal gift for Mom’s first Mother’s Day. 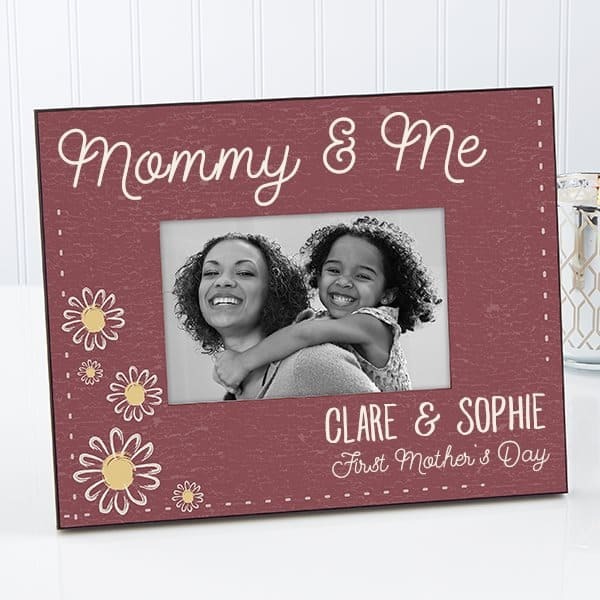 Create a unique gift by personalizing this frame with any title of your choice (Mommy & Me, First Mother’s Day, etc.) at the top. Underneath the picture opening there’s room for 2 additional lines of text which slightly overlap for a stylish look. It’s easy to find a frame that will match any home’s decor since you can choose from 4 different color schemes – Green, Brown, Blue, and Burgundy. Those little hands and feet grow so quickly, and believe me, Mom will always want a reminder of just how tiny those little hands were once. This striking frame is sure to be a gift that the new Mom will treasure forever. The kit includes an easy-to-use, no-mess ink kit for getting the perfect prints of the tyke’s little hands and feet. The kit comes with extra cards, so there’s room for error (and you can always use the reverse of the cards). This lovely picture frame is a present that the new mom will enjoy for years to come! Traditional wood frame comes in 3 different sizes ( 4″x6″, 5″x7″, and 8″x10″). Engraved at the top is the title “My First Mother’s Day”. You can add any 2 lines of your choice beneath the picture – a perfect place for the date and names. Looks great on the wall (hangers are included) or displayed on the table with the included easel. This fabulous gift is a wonderful way for the proud Mom to show off a favorite picture! The top of the frame bears the sweet caption “First Mother’s Day”. 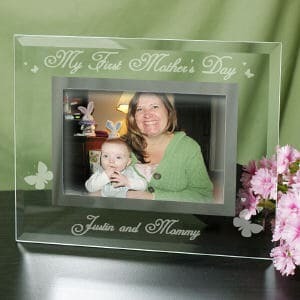 You can personalize this sweet frame with any 2 lines of custom text – such as the date and the mom’s and baby’s names, or a sweet message of love. You can choose whether to have a horizontal or vertical orientation and the text will be placed appropriately. This beautiful frame comes in your choice of 3 soft colors. 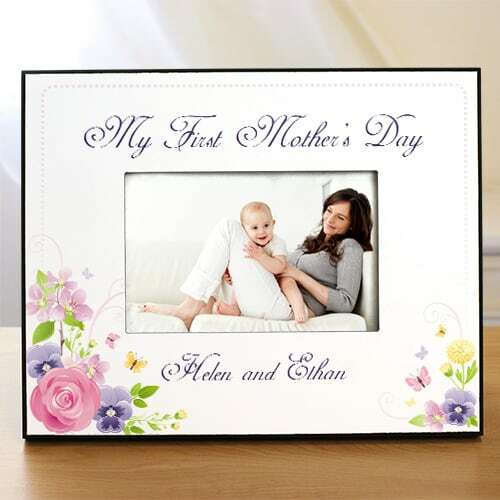 Celebrate the new mom’s special day with this lovely engraved frame. The top of this beautiful frame is engraved with the title My First Mother’s Day in an elegant script and decorated with butterflies. Underneath the photo opening you can add your own custom message. Flowers for Mother’s Day are a time-honored tradition. The new mom will enjoy the flowers on this cheerful frame forever! 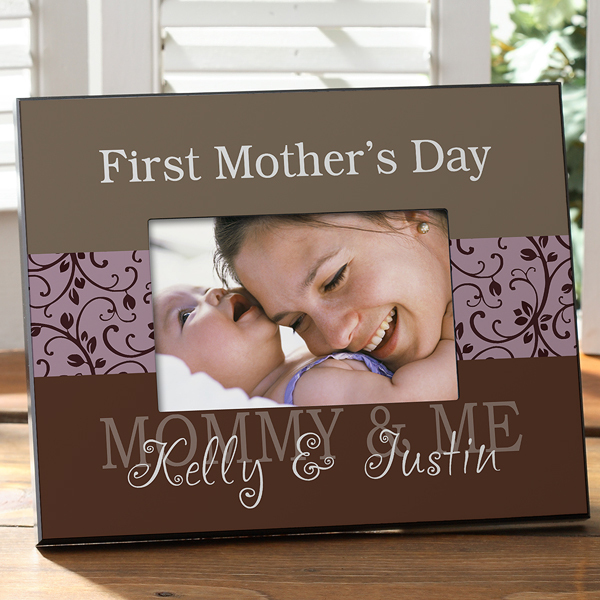 You can add any title you like to the top of the 8″ x 10″ frame (First Mother’s Day, Mommy & Me, I Love Mommy, etc). Beneath the picture there’s room for you to add 2 more lines of any text you’d like. A gift the new Mom will treasure for years to come! Beautiful flowers and butterflies on the cheerful frame remind you of the brightness of a mother’s love. This spring themed frame is the perfect gift to celebrate the initial Mother’s Day. Add a one-line message of your choosing underneath the picture opening. At the top of the pastel frame is the caption “My First Mother’s Day” imprinting in lovely cursive. 8″ x 10″ frame has an easel back for displaying on a table or desk, or you can hang it from the wall.